The 39GS is HP's upgrade to the 39G+, released in August of 2006. The new, enhanced HP 39gs is the ideal classroom graphing education tool designed for solving complex problems with a library of built-in applications and scientific constants, plus the linear equation and triangle solvers. In addition, students can create and store custom aplets with 256KB memory, easily share data and connect with PCs with the choice of USB, serial or infrared ports. 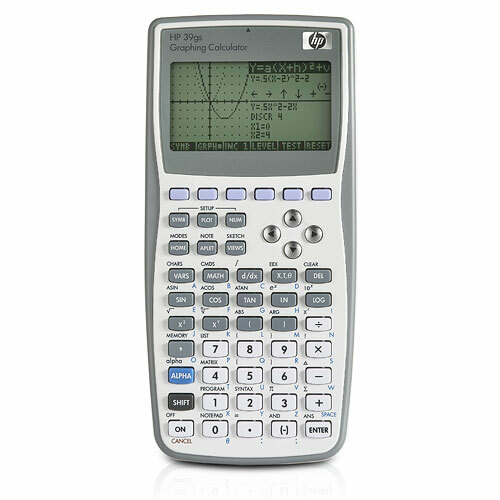 The HP 39gs helps math and science students develop key learning skills and comprehend difficult concepts with symbolic, numeric and graphing views and familiar algebraic data entry. Plus, a large split-screen display with adjustable contrast and interactive history, notes and sketch functions. With an increased battery life and included slide-on hard cover, rely on the the HP 39gs wherever you go. You also get the reassurance of award-winning HP support available to you 24-hours a day, as well as an enhanced website with tutorials, educational resources and downloads.